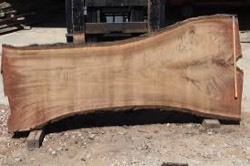 New to Tim's Tree Removal is a service providing you with the opportunity to purchase cut pieces of wood, often referred to as 'live edge' wood. 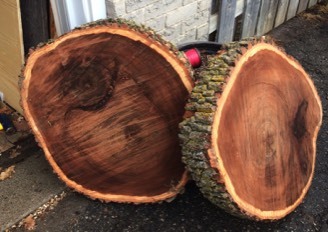 There will be 2 different types of live edge wood we will be offering for sale through our website, and via Kijiji. 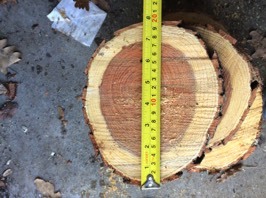 These pieces of wood are cut from a log, or branch and are typicaly circular in nature. We have seen many uses for these pieces, such as coasters, plate chargers, wedding cake platforms, name tags, and pretty much anything else your crafty mind can come up with. The larger pieces, as you'll see below, can even be used as a table. These slabs of wood can be cut in a variety of lengths and thicknesses, in a number of different species of wood. All slabs are cut with our portable chainsaw mill (see below for details). 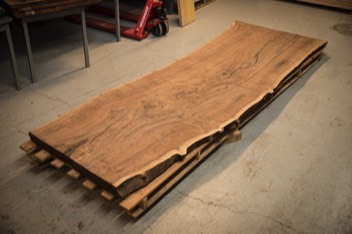 These slabs have a number of uses, from end tables, coffee tables, bench seating, and on the larger end, dining tables. 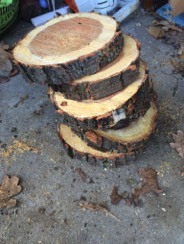 Please note that unless otherwise stated, all wood for sale will be wet (not dried through). As we expand this area of business, both wet and dry wood will be available, along with some already finished decretive and furniture pieces. 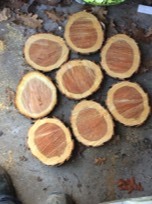 Attached are some examples of live edge rounds and slabs, and some examples of finished pieces. We have recently purchased a chainsaw mill to provide our customers with custom width and length slabs of wood. Have a look at the chainsaw mill in action.